Rabbi Daniel Lapin is a notionally renowned speaker whose personal appearances and dynamic presentations have entertained, enlightened and inspired countless audiences throughout the country. He is also a syndicated radio talk show host who is heard in 30 cities by over 50,000 listeners each week. Rabbi Daniel Lapin is uniquely gifted in his ability to help business audiences understand the basic principles of human nature. In a straightforward and entertaining fashion, he reveals the timeless tenets and psychological secrets of human motivation and leadership, and provides the tools needed to extract premium performance not only from others, but also from ourselves. While living in his native South Africa, Rabbi Lapin taught theology and physics. This seemingly unlikely combination forms the bedrock of his conviction that no conflict exists between the physical and the spiritual, and that God smiles on free market transactions. Rabbi Lapin, together with noted author Michael Medved, established Pacific Jewish Center, a now legendary Orthodox synagogue in Venice, California. As its founding rabbi, he assisted the community in its mission of demonstrating the relevance of traditional Judaism to modern life. In 1991, Rabbi Lapin formed Toward Tradition as a national movement to supply religious and intellectual ammunition to Jews and Christians who support family values and the free market. Toward Tradition now has ten chapters around the country, a national board of directors of 26 distinguished professional from eleven states, and a paid staff of ten. In addition, Rabbi Lapin serves on the board of fellows of the Jewish Policy Center in Washington, DC. In 1996, he began Cascadia Business Institute whose seminars teach corporate management how ancient wisdom used over centuries by Jews to excel in business can be translated into modern day management tools for enhanced business performance. Rabbi Lapin has spoken for nearly 100 groups, institutions, organizations, and companies including Christian Coalition, Crystal Cathedral, Harvard Law School, Heritage Foundation, the Mont Pelerin Society, Prudential Insurance Company, 1996 Republican National Convention, Voices United for Israel, Yeshiva University, and Young President's Organization. In January 1999, Rabbi Lapin spoke at the Congressional Bi-Partisan reception for the 106th Congress in Washington, DC. He has appeared on over 50 radio and television shows, including Focus on the Family with Dr. James Dobson, Jewish Heritage Network, Michael Medved Show, Mike Reagan Show, National Public Radio, Trinity Broadcasting Network, Wake Up America, and the Judith Regan Show on Fox News. 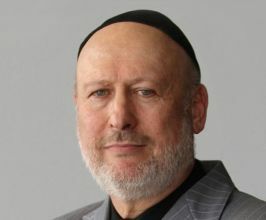 Rabbi Lapin is a noted writer, and his articles have appeared in the Wall Street Journal, National Review, Commentary, The Jewish Press, The American Enterprise, The Washington Times, Crisis, and other publications. His first book, America's Real War was published in December 1998. His nationally syndicated radio talk show, Rabbi Lapin's Thoughtools, is carried on stations all over the country. All American Speakers is a speakers bureau and booking agency providing information on booking Rabbi Daniel Lapin for speaking engagements, personal appearances and corporate events. Contact an All American Speakers Bureau booking agent for more information on Rabbi Daniel Lapin speaking fees, availability, speech topics and cost to hire for your next event. Please Note: All American Speakers Bureau acts only as an entertainment broker/producer for corporate functions, private engagements and special events. All American Speakers Bureau does not claim or represent itself as the exclusive agent or management of Rabbi Daniel Lapin or any artist on this website. Speaker fees are determined based on a number of factors and may change without notice. Fees often vary based on a number of factors including: speakers schedule, supply and demand, length of presentation, location of event and other factors. Fee Ranges listed on this website are intended to serve only as a guideline. In some cases, the actual price quote may be above or below the stated range.